Ouch! Once again it’s bug bite season. While some insect bites create a minor itchy spot, others can make you seriously sick. Knowing what bugs are in your area, how to protect against bites and what to do if you are bitten is important for everyone to stay healthy. Although most of us who are bitten by mosquitoes only get a small itchy reaction, mosquitoes can pass along more serious diseases like West Nile Virus, various types of encephalitis, and, Chikungunya fever (especially in southern states, and abroad). Some people, including children, can respond with large areas of swelling and severe illness. If you get a bite, it is important to try not to scratch, as you may cause the area to become infected. Use hydrocortisone cream or calamine lotion to reduce itching. If the bite site becomes infected or gets large, go see your health care provider. Use a bug spray containing 20% or more of the ingredient DEET. Be careful using bug repellent with children – read the instructions first. If you also use sunscreen, put it on on first, followed by the bug spray. Ticks can carry Lyme disease, Rocky Mountain spotted fever and other serious diseases. You’re at a higher risk for tick bites if you’re often in wooded or grassy areas. The longer a blood-filled tick is attached to a human or animal host, the more likely that tick will transmit diseases. People on the East Coast, Midwestern states and the Pacific coast, especially northern California, are at high risk. Use bug spray and bug repellent clothing. Cover up as much as possible if you’re going into the woods or grassy fields. Check your body for ticks immediately after leaving a high-risk area. Remove ticks from skin using tweezers. Keep the tick in a jar, in case your doctor wants to see it. Consider going to your doctor if you get a big bite because you may need to go on antibiotics. Most spider bites are annoying, but not dangerous. If you live in the South or West, you should already be aware of the poisonous spiders such as the black widow or the brown recluse spiders — those bites require immediate medical treatment. Bug spray doesn’t work well for spiders, but wearing protective clothing and avoiding areas where there are likely to be spiders may prevent that bite from ever happening. Bees & Wasps: What’s the buzz? Being stung by a bee or wasp can hurt, or it can be life-threatening if you’re allergic. For those not allergic to bee or wasp stings, treatment of the sting is pretty basic. Take out the stinger, clean the area with soap and water and put antibiotic ointment on the site. Then apply ice and consider taking a medicine that will decrease the itching, such as an antihistamine. If you’re allergic, then have an EpiPen with you at all times, and if you’re stung, you need to seek medical help immediately. Avoid areas where you see bees or wasps and don’t leave food or drinks around that will attract these bugs. Don’t swat at or anger any bee or wasp flying near you — it may just sting you because it’s annoyed. Don’t try to remove nests on your own — get a professional to do that. Bed bugs are found everywhere in the world, including dorm rooms, luxury hotels and cruise ships. Bed bugs are a red-brown color and as the size of a sesame seed, or smaller. Their eggs are tiny and white and their waste creates brownish spots. In recent years, bed bugs have become more common due to international travel and a reduction in the use of more toxic pesticides. Bed bugs live off of human and animal blood and can live for months without a meal. They don’t fly, but they sure can travel far on backpacks, in suitcases and on mattresses and furniture (they can even travel between apartments or hotel rooms through electrical outlets). Bed bug bites look like mosquito bites except sometimes there are 3 or 4 bites in a row. The bites can be itchy, and generally appear a day or more after you are bitten. Treat bites just as you would treat a mosquito bite. Some people will have an allergic reaction, which may require a visit to their health care provider. Know where to look! When you travel, look at your bed, especially in the folds of the mattress, or in furniture near where you sleep. Sometimes the mattress or furniture will have a musty smell. To get rid of bed bugs, everything has to be washed with hot water and dried thoroughly. Some furniture may need to be discarded. You might need a professional pest control company to get rid of big infestations. Travel, especially outside the U.S., brings many opportunities to be bitten or stung by bugs you are not usually exposed to. Before you travel make sure you get appropriate vaccinations and instructions on avoiding diseases spread by bugs. 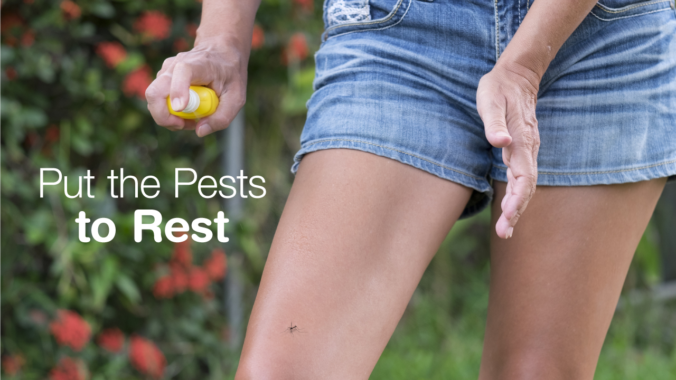 Enjoy the outdoors but be smart about protecting yourself against bug bites! By: Karen Babos, D.O., M.B.A.